The land on which the new building development is situated, the site of the old station and Jam factory there are two shallow shafts identified on British Coal plans. When I went to the depository at Mansfield to view the plans there was nothing on file but the position of the shafts and to note that coal had been mined by two shafts. There appears to be two shallow shafts working in very shallow coal seams or seam, according to legislation having two shafts is either after 1862 or if earlier a very forward thinking company. Why sink two shafts when one will do. The colliery nearby, Bathurst Main Colliery would be similar in seam section etc to that worked in the area of the station. There is nothing in the area on Sandersons Map of 1835 but fields running off Cobster Lane. Farey makes no mention of it in his survey of 1790. 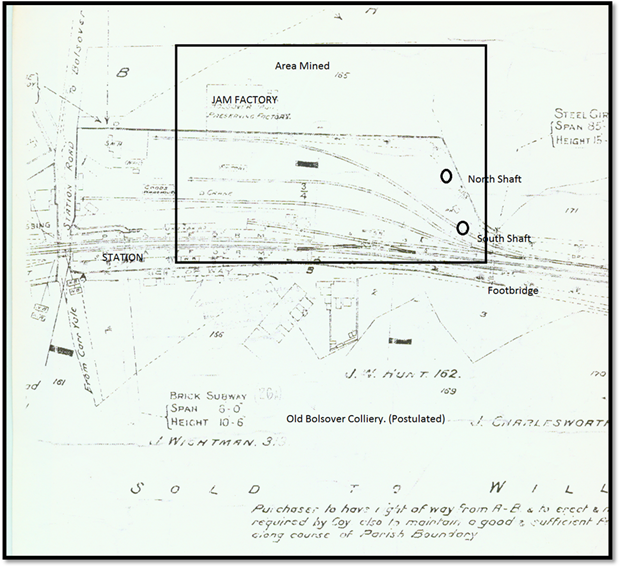 The area in question is situated where the lines from the station all converged so surely the railway company would not have left the area worked out without first filling in the shafts or moving the line away from the mined area. Or at least taking some remedial action. The shafts have been or will be filled in and the topsoil has been removed and the coal exposed and removed as the seam in the workings had become friable or rotten with age. The Lancashire, Derbyshire & East Coast Railway was planned and built between 1891-1896 so the colliery must have been prior to this but one can only say it was mined between 1862 and 1891 but with no certainty. On Coal Authority plans there are two shafts here but there is no further information available. Confusingly the Wales may be called the High Main and the High Main the Silkstone. Also mentioned here is Manor coal. 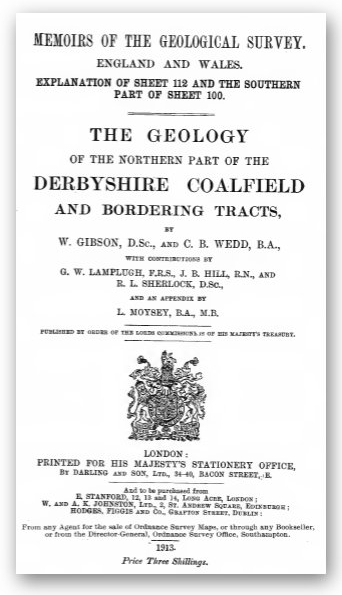 Geology of the Country Around Chesterfield, Matlock and Mansfield. Smith, Rhys and Eden. H.M.S.O.) pp. 189. 178. 180.183.185.187-8.190. 253-4. 311. (Carr Vale). Page 75 of the above book mentions Manor Coal being worked extensively by a level 100 yards south of the railway tunnel mouth.